Overall size of this lithograph is 24" x 30"
August 28, 1972. Captain Steve Ritchie, flying his favorite F-4 #463, was leading Buick Flight from the east over North Vietnam. Suddenly, there was a lot of chatter over the UHF radio...chatter from Red Crown (Navy radar ship) off the coast and Disco (Air Force RC-121 orbiting over Laos). Buick Flight was alerted to two MIG-21s (Blue Bandits) 60 Miles away. Ritchie headed southwest, in the direction to intercept, passing huge thunderheads and cumulus clouds. Red Crown called, "MiGs are RTB (ordered back to Hanoi). They are in your front quarter Buick...40 miles and closing...25, 15, 10, 5." 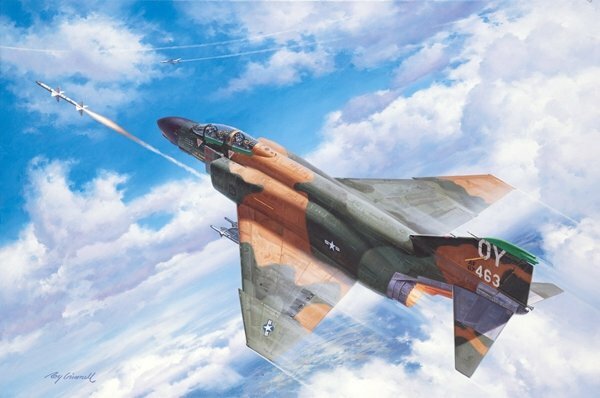 Ritchie strained for a visual and jammed the throttles of his big jet into full afterburner, climbing and turning toward the targets. Right now...two miles. Red Crown called again, "Bandits 239..." Ritchie, "I got'em, I got'em." The future Ace tightened his left turn to the max and the Four Star Phantom strained under the G forces. Two Sparrow missiles were fired...nothing, out of range. Now, in the six o'clock position and closing, Ritchie fired the last two Sparrows. First the left...then the right. The enemy fighters were at the edge of the AIM-7 envelope and slipped into a thin overcast. Seconds ticked by...18, 19, 20. Suddenly, emerging from the haze, the first missile streaked by on the left, spooked the lead MiG into a right turn, and solved the problem for the second Sparrow. A fireball engulfed the MiG-21 and lit up the sky. Captain Steve Ritchie of the famed 555th Fighter Squadron had just become the first and only Air Force Pilot Ace of the Vietnam War. Hand Signed by Ace STEVE RITCHIE and artist ROY GRINNELL.